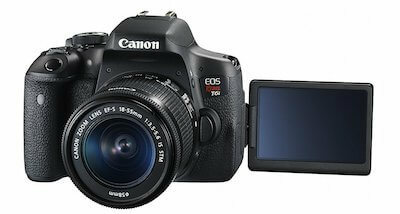 DSLR is a popular type of camera preferred by professional Vloggers. It is used by some of the most successful and highest paid YouTubers in the world, and they make millions out of their videos after having invested several hundred dollars on a multi-purpose DSLR. Its advanced digital imaging sensor and high functionality makes it ideal for Vlogging, and helps you shoot great videos, perfect to make your potential fans jump up in awe. 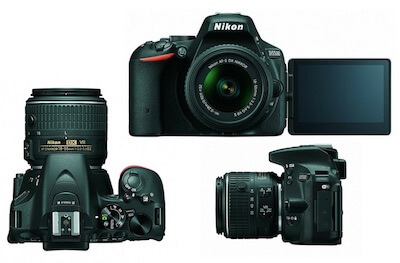 While starters favor point and shoot or mirrorless types, DSLR is the mark of a professional. Best DSLR Camera for YouTubeTo ease you through the process of selecting the best DSLR camera, we have created this list based on our combined of experience in the fields of photography, motion picture, video sampling editing, and acoustics. Note: Clicking on images or red boxes will open a new tab with the price and customer reviews on Amazon. It’s 2017 and teenagers and millennials of your age are making sh#tload of money out of their videos, teenagers earning way more than their parents, credit to their parents for buying them a camera to vlog with and a video editing software subscription. Look at PewDiePie who lives with his YouTuber girlfriend Marzia in a private mansion on some island far, far away from all the nonsense that’s happening in the world right now. He doesn’t have to answer to his parents even when he is in the news for posting racist videos in the name of wit and humor. And yes he uses a DSLR. Before we dive into the details, we must understand why DSLR is preferred for vlogging over other less-expensive types. Vlogging is a relatively new concept compared to why the digital camera was invented in the first place. So, how come YouTubers began taking advantage of the DSLR? The answer is simple and pretty obvious: loads of features and advanced sensory imaging. The lens is the biggest and most-cited feature when it comes to DSLR for vlogging. People browsing YouTube are interested in high-quality videos and images. For 2017 vlog cameras and anything below 720p is considered trash. Even if you are mega talented and have a unique idea for your video blogs, users won’t watch your videos if they are of low quality, and worse, they might not even click on the video thumbnail, unless you adopt clickbait marketing which is a strict no-no in vlogging (courtesy Shane Dawson). This does not mean that mirrorless and a point and shoot camera does not deliver good quality. Some of them are even capable of capturing 4k resolution (Sony Cyber-shot DSC-RX100) while others are often ranked amongst the best vlogging cameras of all time (Canon PowerShot G7 X). If ease is your only factor, there is also the fourth type: camcorders; they are popular amongst YouTubers like Matthew Santoro unless we really believe that Canon paid him to endorse the VIXIA Mini (more on that in the comments if we may). These points should be enough to make you consider a DSLR camera if you are thinking of a transition like your favorite YouTuber did recently. These cameras on this list are based on the balance of price quality and functionality as 2017. If Canon PowerShot G7 X is considered the best point and shoot vlogging camera, then Canon 80D is the best Compact DSLR vlogging camera, and also the best DSLR camera for beginners.Why: It is so easy to use, robust and simple. Why is the 80D so good: It is so easy to use, robust and simple. Used by the likes of Casey Neistat, it offers superb video quality at 1080p/30fps, has an articulating touch-enabled flip screen, works great in low light, has improved battery life than its predecessor (70D), and even comes with a headphone jack so that you can monitor your audio while you shoot. But, its biggest merit is the Dual Pixel Auto Focus (DPAF) which allows you to track objects in your frame and capture great videos effortlessly. The autofocus feature is already excellent in the 70D, and Canon really notches it up by several levels here. Canon 80D is well-suited for both professionals and beginners, the 80D one of the best DSLR camera under the Canon’s high-quality camera umbrella, especially when it’s about making money on YouTube videos. There is nothing more you can ask unless it’s the 5D Mark III that you’re are eyeing up. 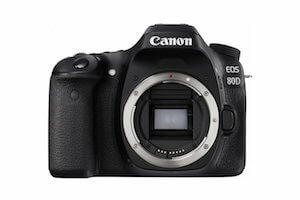 An amazing DSLR but big and heavy, if you want a DSLR camera under $1500 the Canon 80D is the one for you. We have refrained from Mentioning the 70D in this list, as we love it so much and we mention it all the time, you can bag this Classic DSLR under 1000 dollars now, and you will not regret it either. The much-anticipated upgrade to the beloved Rebel series, the T6i is a rockstar when it comes to entry-level DSLR cameras with Flip screen, the is a port for your Rode shotgun microphone, Wifi and great in low light. Directed towards users who are new to the world of vlogging, it comes with better autofocus and can shoot short burst videos – two features that make it a cherished camera amongst vloggers. The video quality is obviously excellent considering Canon’s DSLR lenses are the best in the market, and it is supported by an LCD articulated touchscreen helping you to capture selfie videos with great ease and control. The only down point of the Rebel T6i is that it has terrible battery life for a DSLR. But, it can be easily compensated with an external battery pack, running DSLR cameras with wifi turned off is going to get you some video time. With a better battery life than the Canon Rebel T6i, the Nikon D5500 is a smaller compact DSLR and a lighter version of the D5300 (also featured on our list). While most features are similar between the two, what sets it apart is the touchscreen – which is really important if you are a travel or lifestyle vlogger. You can find this cheap DSLR for under $500, but you will need to shop around, and if you are on a budget then buy second hand, you may get a good DSLR for under 300, or even under 200, quite often owners of good DSLR cameras buy with the intent to learn and then after a year of no effort decide to sell, I bought a good canon DSLR for Under 200 with lenses, Craig’s List..! 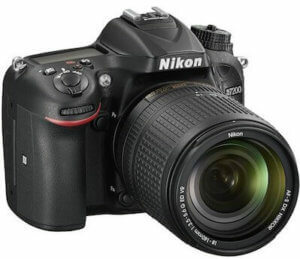 If you are on a Budget check out our best digital cameras under 200. Anyway… Taking advantage of the autofocus has never been easier: just touch the area you want to focus and the D5500 will take care of it. Other than its ability to shoot crisp 1080p resolution videos, it also has a long list of extra features such as a fully articulating screen, bracketing, and better high ISO performance which makes its low light performance slightly better than the Canon DSLR models. Of course, Canon is the leader in colour grading, but Nikon steals the show if you are looking for a cheaper and lighter DSLR. 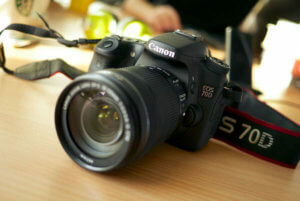 The reason why we listed this below its successor is that we like the D5500 more than this one. 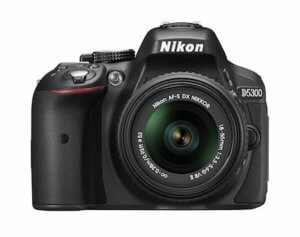 But, independently, the Nikon D5300 is more popular and widely accepted as Nikon’s best DSLR camera for vlogging. Reasons? It performs better (than Canon) in low light, has more battery life than its direct competitor (Rebel T6i), is reasonably cheap DSLR, and gives sharper images and videos regardless of the environment. However, it does have its fair share of disadvantages such as poor autofocus and absence of anti-aliasing filter which does not prevent the dreaded moiré effect. If these two factors are on your consideration list, then it is better to select any of the remaining models we have listed here. But, if the price is your concern and Rebel T6i is your selection, then buying the Nikon DSLR D5300 will be a wiser decision. 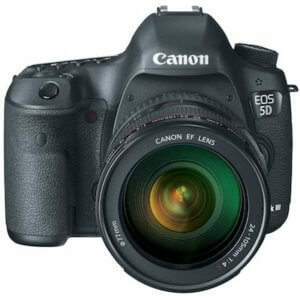 Even though Canon has released Mark IV model, we still consider the 5D Mark III as the best video camera for vlogging. It’s slightly better than the 80D, but the only thing that prevents it from being ranked at #1 is its mind-boggling price. You can pick up this gorgeous DSLR camera under $3000, this one is a profession DSLR camera, a premium product, and should be eyeballed by only those who can afford it. It does give value for money as in the best autofocus feature in the market right now, ability to capture all colors even in high ISOs, incredible low light performance even for the darkest places, and high-quality sharp videos. It is directed at cinematographers and indie filmmakers, but if the color is really important to you (makeup and beauty vloggers), then investing few thousand dollars on this beast won’t be a bad idea. If you consider it, do not ignore the absence of Wi-Fi, NFC, and an articulating screen – which are all important factors for vlogging. The fixed LCD has no touch feature, and the camera itself weighs like a rock used in one of those pyramids, which automatically limits its applications considering you cannot even record in 4k resolution. 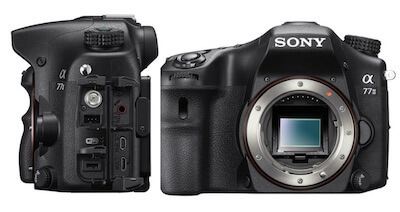 Sony is better known for its range of excellent mirrorless cameras, but it does come to fight in the ring with its best DSLR model – the A77 II. Although it holds up in the essentials department with great video capturing ability and slightly higher color quality than Canon, it drains itself quite too soon. However, one of its biggest features is the optical image stabilizer (OIS), which is the sole reason why so many YouTubers take it along with them to shoot action and prank videos. Additionally, you won’t need extra lenses when you are using the Sony A77 II just because of the OIS. The autofocus is as good as in Canon’s 80D, but when you compare the two, it is really hard to select one. With support for 1080p resolution and phenomenal battery life than most models featured here, it is preferred by those who shoot a lot of videos. With dual SD card slots, unmatched performance in higher ISOs, built-in intervalometer for time-lapse, and brilliant image quality. But one big flaw in my opinion. No Flip Screen – So, how does one hold up without a flip screen and charge more than the other DSLR cameras in its class? Personally, flip screen is so important now that you should check first the best digital cameras with flip screen. Even though the above seven models are the best of the best, it is suggested that you take a look at these five cameras, too. As a note, Panasonic was once regarded as the greatest camera maker in the world. We hope the above list will make your hunt for the best DSLR camera easier. And once you make the purchase, let us know I it was a good return on investment in the comments. This article is purely on camera bodies, there are different lenses to consider; the best lenses for canon, the best lens for Nikon etc, we will be creating videos with YouTubers to give you visual examples of the best accessories to buy and for each type of shot. As for sound, you’ve got to have a DSLR with a shotgun mic if you want to have a professional sound. There are lots of tips, tricks, and advice. We want to hear the experiences of other You-tubers, so please get in touch for a guest post video. Coming soon we have an article/video on the best DSLR stabilizer and how to make a DSLR camera stabilizer – DIY style. Thanks for reading our list of the top DSLR vlogging cameras right now (February 2017).